Earn up to 1,656 reward points. Plenty of power, pristine clean tones and headroom in a pocket-sized head. Designed with an emphasis on analog, VOX’s MV50 combines classic amplifier design with new and innovative production techniques to produce a miniature amplifier with truly monstrous sound. Boasting an incredible 50 watts of power, this one-pound package serves up serious guitar tone that’s reminiscent of your favorite old tube amps. 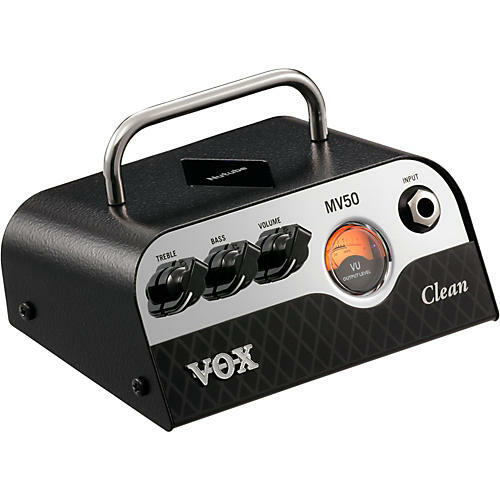 With speaker and line/headphone outputs, the MV50 is perfect for the stage, at home, or in the studio for direct recording. Though designed with the compact BC108 in mind, the MV50 is a perfect match for nearly any speaker cabinet. The EQ switch on the back of the amplifier features two distinct settings, FLAT and DEEP. When connected to a small cabinet, such as the BC108, setting the amplifier to the DEEP mode will emphasize the rich low-frequency range and prevent the high frequencies from becoming too pronounced. When connected to a larger, more conventional speaker cabinet, setting the amplifier to the FLAT mode will allow you to take full advantage of the characteristics of the speaker cabinet, without emphasizing or reducing any frequency range.